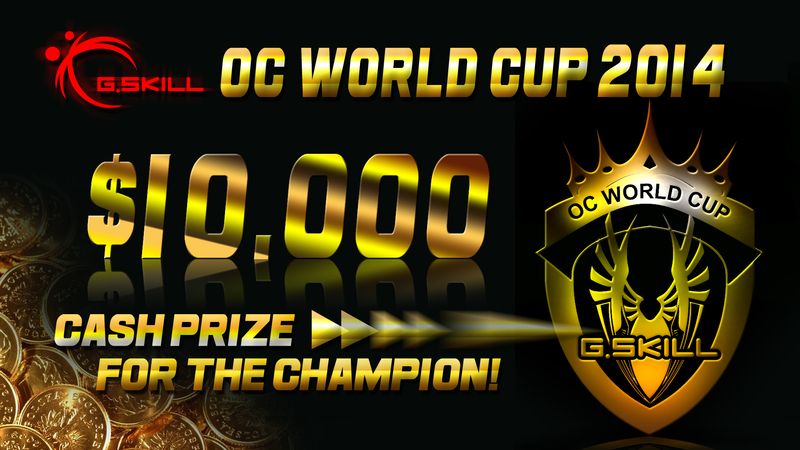 G.SKILL OC World Cup 2014 Qualifier is closed since 27 April 2014. The qualifier runs from 2014-03-24 12:00:00 GMT+0 until 2014-04-27 12:00:00 GMT+0. The top-6 overall receive an entry ticket to compete for the USD $10,000 in the live final at Computex 2014. Important: the prize includes only a spot in the final at Computex. It does not include travel or hotel expenses! You must come to Computex by yourself. In case any of the six qualified overclockers can not make it to the event, the spot will be made available to 7th, 8th, 9th,... place. Amongst all participants a G.SKILL TridentX 2400 CL9 8GB (2x4GB) memory kit will be given to a lucky winner! The participants must adhere to the following rules for the competition stages. 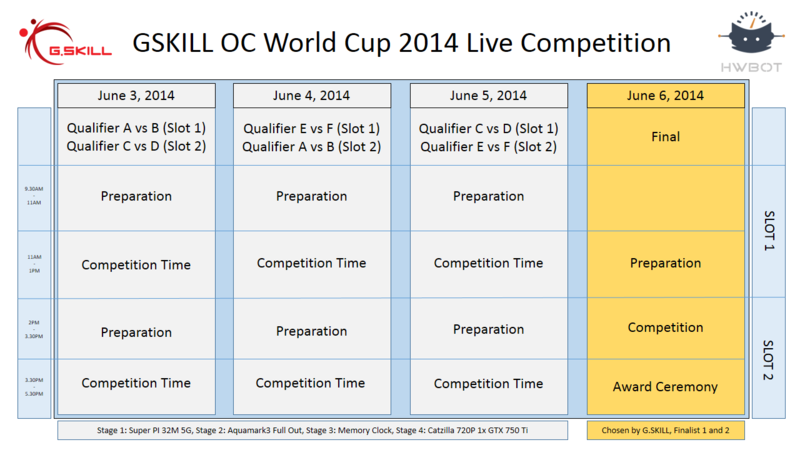 The detail rules and event schedule of live qualifiers and final challenge will be released in April. People who qualifiy for the live event must bring their own hardware to the event. Hardware includes G.SKILL memory, CPU, Motherboard and VGA, torch, LN2 container, thermos. Not for mortals, especially when expenses for the travel/hotel/etc are not covered, but definitely interesting to watch. Why all the hate against Multi-thread. Limited to Z87 ... that is hardly the most memory bandwidth friendly platform. I have my WR to thank for the G.skill ram I used on a 4p system. Terrible platform limits, terrible program choice. Random thought: why not limit the memory clock stage to a certain CAS latency? This could allow people to use their "casual benching hardware" for top submissions without having to spend the extra money on useless single-sided MFR (cheapest of which is 2800C12 with a pricetag above 200€) and IMC binning. So do we need receipts for everything? Also is it okay to go halves with a friend and split a kit? Lastly 780ti lightning allowed or not? Your right it would be much more logical for everyone to bench 4P systems, where the price of entry for a single cpu is more than the entire cost of hardware for the remaining stages. . .
Hahaha..... I want to be XA competitor !! Goes to show you how much 6.7 haswell is really worth! Let me know if you need help. Can buy and ship to you guys if needed. So there not paying for the trip and hotel? Pretty interesting choice for this..
"People who qualifiy for the live event must bring their own hardware to the event. Hardware includes G.SKILL memory, CPU, Motherboard and VGA, torch, LN2 container, thermos." Good luck to cpu mafia. No flight and hotel is actually not a big problem as a lot of overclockers will be at computex anyway. However taking all the hardware with you is a big problem. Firstly because you are limited by 20-25kg weight depending on the airline. Secondly because the guys with the biggest wallets will win if you don't do stickt limitations or fixed clock competitions. Even if I would qualify I would never have a chance against the sick CPUs from ViVi or John Lam. Only manufacturers or also people who work at e.g. a computer store? lol its all good, can only try right? I think this will be popular to the Japanese and Chinese benchers. My only gripe, I dont want to see peoples high binned MFR that are judges or ineligible given to teammates no way to track this really so it is what it is. Other than that, thanks GSKILL for having a contest!! Going to be a great fight! And for all other overclocker ??? it will still be epic! My personal opinion: I agree with earlier comments. This so called open qualifier is essentially a way to immediately separate the guys that have already been selected and predicted. a. Have Access to fast amounts of money and or huge crates full of hardware that they can try (who picks up the bill?). b. Have sponsors behind them (are they than not viewed as working for a manufacturer.....?. What about the people that go there professionally (as said before) are they not viewed as working for a manufacturer even in related areas? . While their companies pay the bills. d. As predicted in earlier comments the winners are already easily to pinpoint. e. Have enough money to travel to (for me) the other side of the world. F. It is stated that the area is at small walking distance? Personally I am disabled I can't walk very far. All in all even though I like events like this, I feel that this is not really an open and fair contest. Why not give people that use normal 24/7 use-able Pc's and only on th free market available air and water cooling. That way at least a lot more people can enter and have a chance to win. On top of that, making it really a truly exciting event because nobody could than predict the winners. Famous quote by:Mark McKinnon:The initial attraction of a political convention=open contest, was that often the outcome was not preordained. There was at least some element of surprise. But, now it's like tuning in to a movie where you already know the plot and the ending. It's just not that interesting..
we can team up with a friend for the finale? The format is somewhat interesting, but it will most likely be won by someone with the best resources (even rule 1d allows to bin cards at home), not necessarily the best "talent". I like the rules Pretty cool. Also the format will be very interesting to watch. Looking forward to it! Binning cards is not allowed. The cards are provided by the organization. Also, FYI, the winner can choose the time slots for the competition first. 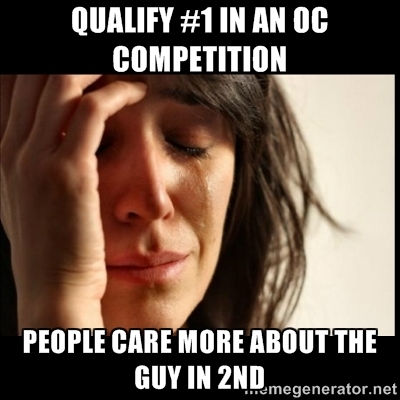 So winning the online qualifier will give the benefit of choosing the time to compete. If provided card is dead, you can buy your own. Regardless of supervision, you can bin bucketloads of cards on your own and change SN sticker in the end. Things get even easier if you "know" the shop you buy it from. You think people won't at least consider this when $10k (plus cost of binning and computex trip) is on the line? ASIC will be recorded for shipped card as i know is not possible ( very easy ) to change it. is 780TI matrix allowed for qualifier? Please remove my 32m sub, I just accidentally clicked the participate button, lol!! Practically this means: make sure you keep the heatsinks of your memory kit to show the part number in case there's a problem. I'm sure it won't be necessary, but well you never know. The rules are applied retro-actively. the benchmark choices and restrictions will also restrict the impact binned CPUs will have in the live final, you will need to combine all the big overclocking skills to win this, modding, clocking, tweaking, binning and do it all under pressure. the multi day format also lends itself to the most consistent overclocker, so even if you have a nightmare day, you still have the chance. Comp is great for guys already going to computex I think the top 6 will probably already be going which is smart. The picture of the spreader rule is cute lol all it does is ensure that you have gskill laying around, not that you are using it but maybe it will detract some cheating. Can anyone clarify what will happen with the 750ti? we will get one if we pass to next round before the show or? Nice things on the fly!!! daaaamn thats heavy. Welldone JJJC for making it in now! The only one can say 8pack mem is not retail is gskill, already sent an email to them. Nice 3d roman and well done on cfr michal and everyone else! Things got interesting with the score being removed so we'll see what happens, but either way I will be in Taipei and see you dudes all the same! I have been removed and you have not even asked GSKILL. I would check with Frank before removing a valid submission. Hiwa is completely correct. SO I ask again why have I been removed when not one of you has confirmation from GSKILL of this? As far as I am concerned the sticks are fine. I bought the modules and have a receipt for them. They where not a sample. Just checked with G.SKILL and we confirmed 8 Pack's kit is purchased and retail. We restored his 3DMark score. One more item to check and then we can finalize the winners list. Nice benching all!! Just checked with G.SKILL and we confirmed 8 Pack's kit is purchased and retail. Nothing against 8-Pack, but if G.Skill claim that this is a retail kit, can we see any official mention of this model or link to any webshop where it was available at or before the start of competition? I was wondering why all the 32M scores were going up last night, I've not been paying enough attention to benching to even know this was going on! Some sweet new scores! "We don't want to get into too much detail on the new G.Skill kit we're looking at today because for starters it's not yet released"
It was posted in 2012. The article has word "unreleased" all over it and I, personally, have never ever seen this kit in the wild or on the shelf in US, EU or Asia. If G.Skill accept the sub it's their call. Won't be the first or last competition with definition of "retail" messed up. Anything on the lucky draw? Straight vaporware in the US but it might have been retail in the EU or UK for a brief period like the 2400 c8s. i found one post about this Kit, it was from G.Skill. And the same as Sam "unreleased"
Totally Allen... you are the king !! Even baidu is empty, now that is something new. ahaha hnice one Splave ^^ but 1vs1 Splave vs 8.Pack they wont have enought space for you two on stage ! too much muscle per square meters ! armwrestle win is golden score ? Press one rep it is!!! Nice idea Major!!! Hey Splave I actually said well done first up man!!! Great 2d benching as always. We need to ban Xtreme addict. 1.43r is es special asrock version never for sale! Think Nick posted that one on XS a while back, no? What if I used an engineering sample of my pots? What if I used ES mounting for EK-SF3D pot? Or ES Antec benchtable? If we were to go this deep could we ban everyone in the top 6 for using non retail OS versions??? Bromance overload in top6 this time around! Okay, final list has been approved. lol!! at Splave and Sofos !! !